Here is some news from South Australia. 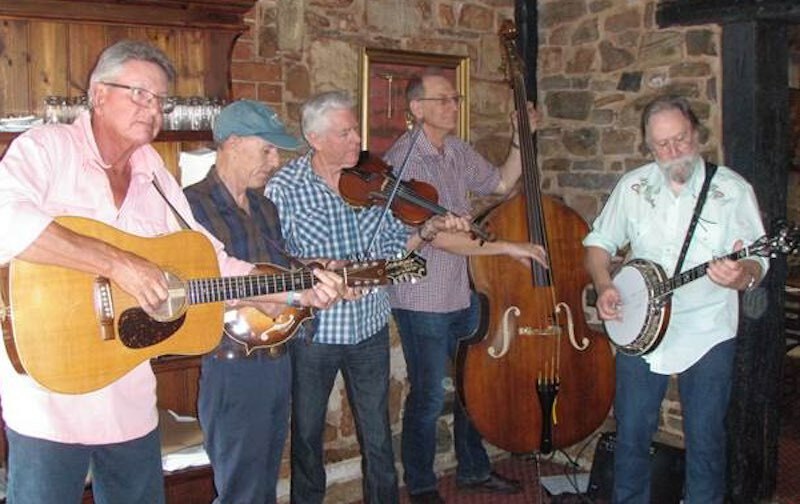 Bluegrass Junction featuring some the very best bluegrass musicians that Adelaide has to offer is playing a freebie at the Wheatsheaf Hotel in George Street, Thebarton. When? On Sunday 4 June 2017 from 4.30 – 7.00pm. Bluegrass Junction is South Australia’s premier bluegrass band, made up of musicians who share a lifetime’s passion for old-fashioned hard-core three-chord bluegrass music – with great instrumental skills and strong harmonies driven by the power of a bass fiddle. Trevor and Nick share lead vocals, providing a refreshing variety of songs, and John adds tenor harmony to get that ‘high, lonesome sound’ that characterises traditional bluegrass. Bluegrass Junction was formed in 1997. However, the band’s roots go back decades earlier. One reason for its extensive repertoire and authentic sound is the fact that Trevor, Nick and Geoff and John all have played bluegrass in various Adelaide band configurations for more than 30 years. Often these four shared places in each other’s groups before formally creating BJ in ‘97. We’ve been very fortunate that Stephen Loss has joined us to play bass and sing a few harmonies. The result, an almost intuitive understanding of each other’s approach to playing and singing, is what gives Bluegrass Junction the ‘special edge’ for the great bluegrass standards written in the 1950s and 1960s by the masters of the genre: Bill Monroe, Lester Flatt and Earl Scruggs; Jimmy Martin, and the Stanley Brothers. Bluegrass Junction also has a fondness for the tunes of Monroe’s long-time fiddler, Kenny Baker, and is the only band in Australia regularly featuring twin-fiddle numbers. Wheatsheaf Hotel in George Street, Thebarton. When? On Sunday 4 June 2017 from 4.30 – 7.00pm.